The Manchester United shirt sponsor from 1990 to 1992 was Sharp. 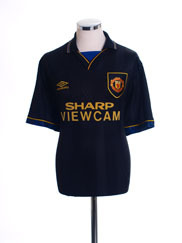 Relive Manchester United’s 1990/1991 season with this vintage Adidas away football shirt. Very rare away shirt of Manchester United. 1991-92.